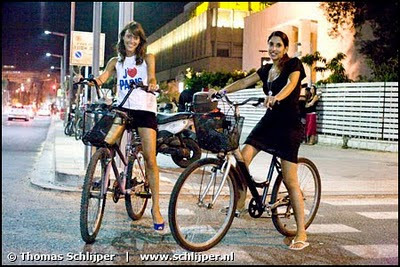 Tel Aviv Cyclists, by Thomas Schlijper. Last year Israel implemented an all ages helmet law for it's citizens, despite the fact that helmet laws appear to becoming less popular over the past couple of years. The Ministerial Committee for Legislation has now decided to support a bill that would modify the law to exclude adults cycling in urban areas from being forced to wear a helmet, The Jerusalem Post reports. The Ministerial Committee for Legislation threw its support on Sunday behind a bill which would remove the requirement for adults to wear a helmet while riding a bicycle in the city. The bill, sponsored by MK Sheli Yehimovich (Labor) repeals part of the Helmet Law which was passed last year. Instead of requiring a helmet for intra-city riding, Yehimovich's bill would leave that decision up to the adult rider. Children, those riding off-road or those biking between cities would still be required to wear a helmet. "Riding a bike in communities and especially in cities significantly reduces traffic congestion, parking difficulties, air pollution and accidents. Requiring helmets drove many people away from their bikes and back to their cars because of the hassle of wearing a helmet and carrying it around," the MK said in a statement. "In Paris and other European cities, there are wonderful programs which provide bikes for transport and no one requires a helmet there. Tel Aviv has also signed a contract to station 2,000 bikes around the city but the project has been held up because of the Helmet Law. Moreover, the law is unenforceable and the police have said they do not plan to even attempt to enforce it," she added. The bill hasn't passed just yet. There are three votes in the Knesset to come. Nevertheless there are signs that rationality is returning to our species. The problem that helmet laws pose for bike share programmes is not new. Australia is pondering what to do with this contradictory mix. Mike Rubbo, the documentary filmmaker, tries to get to the bottom of it at his blog. We've posted about Israel and Australia previously regarding helmets and bike share. Besides that, the law is rarely enforced.Source. Hungary has, in their recent amendments to the Highway Code included a helmet detail regarding speed limits. If you're cycling outside of cities and want to ride 50 km/h or more, you can do so if you wear a helmet. If you don't wear it, you're only allowed to ride 40 km/h. Source: this post, in the comments. Nothing to do with this post, but it's just humourous.